Land and River, Fire and Sky: Steel and henna, giants and tiny cars! This wasn't enough for me to make a video about, in light of my last post, but yesterday was busy! I re-authorized on MIG welding and the metals chopsaw, and got authorized for the pedestal grinder and angle grinder. I also attended a class on henna art Ashley was running... Ashley is another new member, and pretty handy generally, so this helps her get points she needs to make the membership affordable. So... 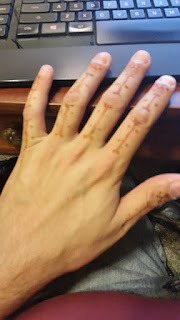 I now have little henna bones on my left hand, that I did myself! See? Those who know me, know I have issues with having stuff on my hands... gloves, grease, even lotion. I can manage a while, but, eventually, my hand-washing compulsion takes over and I start to get anxious. So, I didn't use a lot of henna and I didn't let it set too long, which is why it's not darker. We discovered an issue with the Bluesmobile, that issue being I'M HUGE! The driver has to be able to enter and exit the car in five seconds, but when you put a steering column in, that becomes a BIG problem for me... I barely fit as it is. Various entertaining ideas are being considered, though. PRS doesn't take itself TOO seriously, so we have options. Amusing options. I'm headed back in now to do more metalwork! I'll be there all day, pretty much, since it seems my sleep schedule is back to normal... feel free to come by and hang out, keep me company, let me give you a tour, meet people! I still need a hand with stuff, though... I need supplies like protective gear and materials for projects. Also, honestly, if someone wanted to lend a hand with my membership, it'd be a huge, awesome deal. Now that I have my hand in on many of PS1's resources (read: tools and reasons to use the scrap that comes through there), I'm ALL ABOUT doing stuff!